Start this ball exercise by standing next to the exercise ball with the right knee on the ball as above. Push yourself up onto the ball with the other leg. Put your left leg onto the ball and roll your right leg over and place it onto the floor on the other side of the exercise ball. When the right foot hits the ground, bend the right knee and push back up onto the ball. Repeat this back and forth, slowly at first. 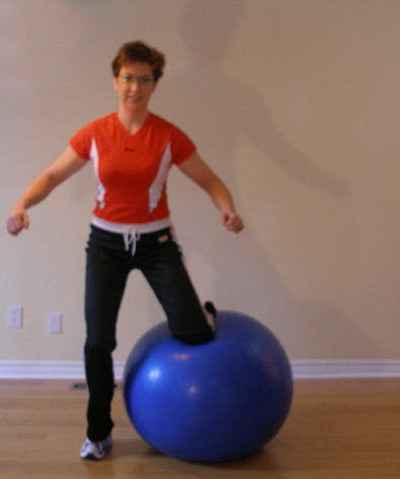 You should be able to balance on the ball for at least a minute on your shins prior to doing the exercise ball exercise. Don't do this ball exercise if you have knee pain. Pick up the pace and include deeper knee bends as you come off the exercise ball. 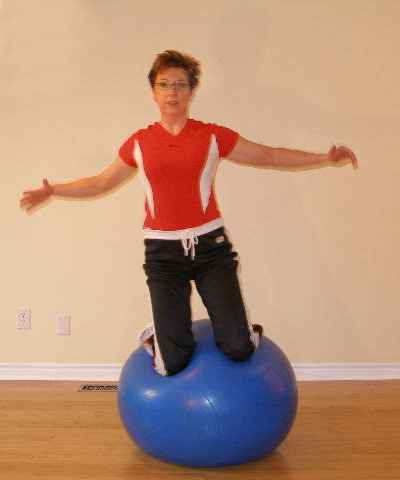 This is a very demanding exercise ball exercise because you have to maintain neutral spinal position while balancing, while limbs are moving, and while your weight shifts across the ball. You may find this ball exercise easier to start if you use a soft ball and use it on an exercise mat (the thicker, the easier). This is especially good for hockey players. Click here for more exercises for hockey. RRepeat this ball exercise 15 times.